How can I determine my version of the Barcode Label Software? I am not sure what version I am using or if it can generate 2D barcodes. 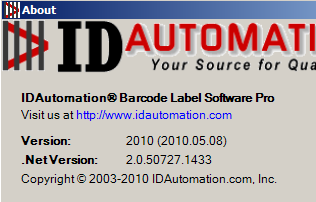 There are a couple of ways to determine the version of the IDAutomation Barcode Label Software. The Standard Barcode Label Software generates Linear barcodes such as Code 128, Code 39, Interleaved 2 of 5, and UPC. The Barcode Label Software Pro Version generates Linear and 2D Barcodes including Data Matrix and QR Code. 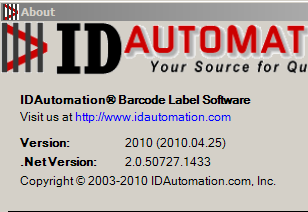 The Free Barcode Label Software will generate Code 39 barcodes. Open the application. The top left side of the application will display the type (Pro version or not) and the year it was released. Open the application. Select Help -- About. This window displays the type, the year and the version number. » Why does the image position move when loading a new image?